Booklet style wedding program. Cover made from heavyweight deep plum pearlescent Italian cardstock (scored for easy folding) Holes diecut into the spine of the program. Print your ceremony information on the pearlescent pearl white Inside 70 Lb Printing Sheet (standard 8.5x11 inches). This inside sheet can also be printed on both sides. 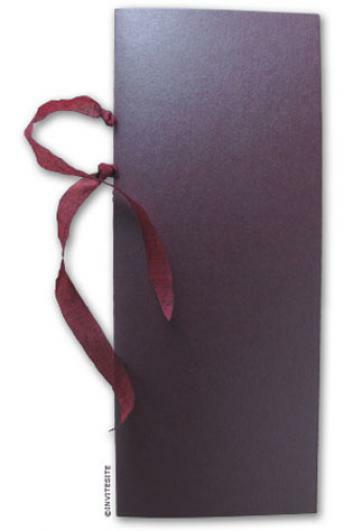 Bound with a length of textured burgundy ribbon. We allocate one half yard (18 inches) per program.